All versions of the Nissan Qashqai have at least six airbags, stability control and emergency brake assist, while a Smart Vision Pack (optional on Visia and Acenta trims, and standard on more expensive models) adds lane-departure and collision-warning systems. 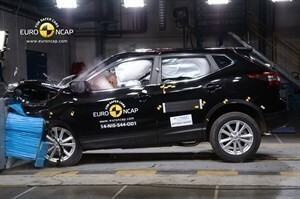 The Qashqai also got a maximum five-star crash test rating from Euro NCAP. An engine immobiliser helps protect against thieves. improved fuel economy and lower CO2 emissions compared to their predecessors. The entry-level 1.2 DIG-T petrol engine emits 129g/km of CO2, and will be joined in autumn 2014 by the 1.6 DIG-T, which develops 148bhp whilst emitting just 132g/km CO2 emissions. The latest 1.5 dCi Diesel unit is the entry-level diesel engine. CO2 emissions for this model have dropped to 99g/km and with EU Combined fuel economy of 74.3mpg which in real world terms should provide at least 50 mpg. The Nissan Qashqai is well suited to family life, thanks to the Qashqai’s huge boot and spacious feeling interior. The rear seats don’t do anything particularly clever, but they do fold flat without the need to flip up the seatbases first. All model aprt from the entry-level Visia also come with a false boot floor, under which you can store your parcel shelf when you’re not using it. 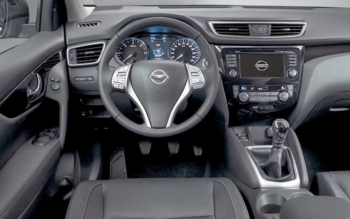 Nissan’s latest Qashqai gets the basic things right, by having lots of adjustment to the driver’s seat and even the steering wheel. The driver interface and console are very easy to use. One drawback is that the thick front and rear pillars can obstruct view, and adjustable lumbar support only come with the top models. The New Nissan Qashqai is a stylish, sleek looking crossover with aerodynamic looks. It has prominent wheel arches, a sculpted body this helps appeal to the average customer, whether it family or anything else. The Nissan Qashqai is one of the best-selling vehicles in the UK; also it’s the bestselling SUV Crossover in the UK. The latest generation 2015 Nissan Qashqai is on sale now, with Nissan order banks filling up very fast. There are some exterior tweaks that will be consistent with the all new Nissan X-Trail model. The Qashqai’s features include new larger headlights, a curvy new front fascia and grille. A new more desirable spoiler adds a little bit of a sporty feeling. 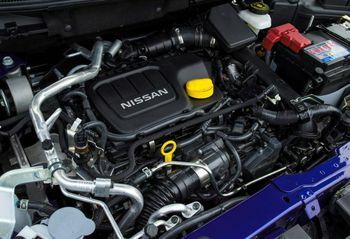 On the whole the new Nissan Qashqai has been designed better than anyone could have imagined and also has engines to avoid any road tax whatsoever, What more could you need? This feature allows you to lock, unlock and start your Qashqai whilst the key stays securely in your bag or pocket. The high-definition 5" TFT colour display screen provides details about chassis control and safety shield functions, as well as tyre pressure monitoring, instant navigation access, incoming calls and much more. Parking Assist measures the available space to make sure there's enough room. It also has Auto Mode - so it does the steering for you to slide the car effortlessly into place. 2014 TOW CAR AWARDS Crossover of the year. 4 Nissan Qashqai Acenta are available at UK Car Discount! Click here to see our Nissan Qashqai Acenta offers.